"Hey pal - you bored already?" "I'm kinda half bored, half fascinated." French distributor Mars Films has released the first trailer for Woody Allen's new film Café Society, which is opening the 2016 Cannes Film Festival in just a few weeks. Allen goes back to telling a romantic period piece focusing on a young man who lands in Hollywood in the 1930s, during the "vibrant café society that defined the spirit of the age". This looks like another fun inside look at the early days of Hollywood, with the kind of eccentric cast we've come to expect from Allen. Jesse Eisenberg stars with Kristen Stewart as his love interest, plus Jeannie Berlin, Steve Carell, Blake Lively, Parker Posey, Corey Stoll, Ken Stott & Paul Schneider. Enjoy. A young man arrives in Hollywood during the 1930s hoping to work in the film industry. There, he falls in love, and finds himself swept up in the vibrant café society that defined the spirit of the age. 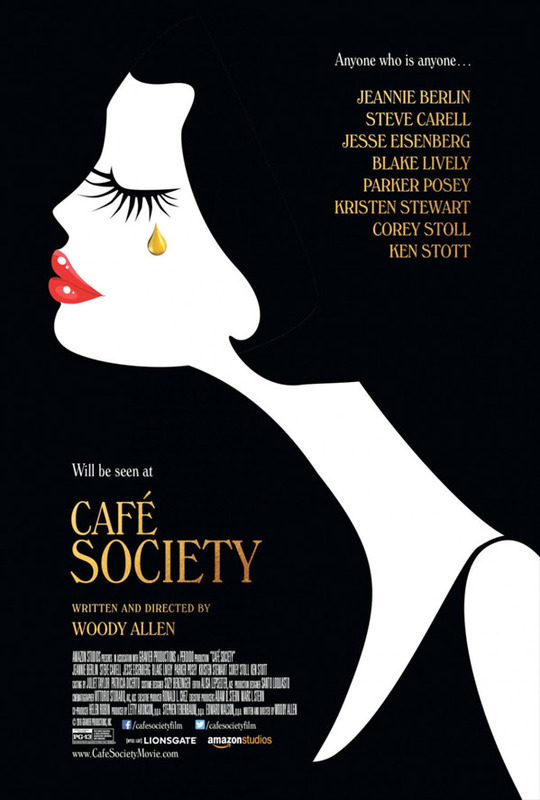 Café Society is the latest film written & directed by the legendary Woody Allen, of Midnight in Paris, Match Point, Scoop, Cassandra's Dream, Vicky Cristina Barcelona, Annie Hall, Manhattan, and most recently To Rome with Love, Blue Jasmine, Magic in the Moonlight, and Irrational Man just last year. The film will premiere as the Opening Night Film at the 2016 Cannes Film Festival this May. Amazon Studios will then be releasing Woody Allen's Café Society in theaters starting August 12th later this summer. Your thoughts on this one? Woah, this looks really good. Allen might be a deviant, but he can still crank out a flick! You know, that's the perfect description for Allen (besides "genius"). "Deviant", not those other things people say. I, of course, understand what you mean. Somehow, I wasn't surprised when it happened which doesn't mean I wasn't appalled. But then again, I do understand him (which is different from approving) since he can make movies and has a relationship he can control. Definitely not the nicest thing to do. What is really fascinating, it works. So it got normalized. And there's some artistic perspective and integrity about that. No matter what you or I think about morals. In some respect, he reminds me on Charlie Chaplin ... And, as for jealousy, it was a tease, you got it, right? You are 100% wrong about that statement and I think you know it too. If you DON'T know it you certainly shouldn't call yourself a fan of movies. You sure can call yourself uninformed however. "Unrequited love kills more people a year than tuberculosis"
This looks pretty damn good! I'm feelin it. I'm also enjoying seeing Steve Carell getting a lot of roles in good films lately. Can someone please tell me how in the heck Jesse Eisenberg (Nervous Nelly) keeps getting work?!? !